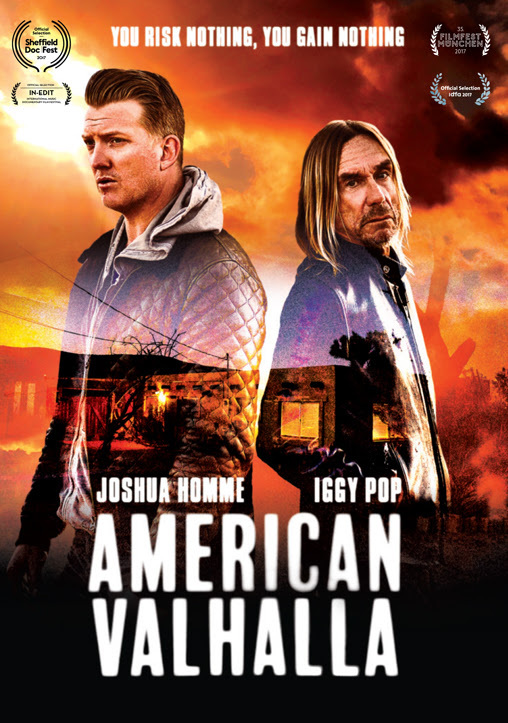 Eagle Rock Entertainment is proud to release American Valhalla – the vivid documentary tracing the musical journey of Iggy Pop and Joshua Homme – on DVD and digital formats on March 9. Something miraculous happens when two kindred spirits collaborate…which is exactly what happened when Iggy Pop and Queens Of The Stone Age frontman Joshua Homme joined forces to create Pop’s 2016 album Post Pop Depression. 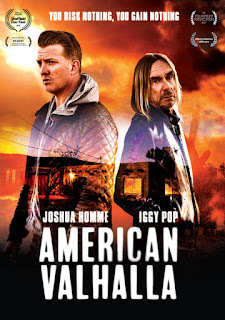 American Valhalla, co-directed by Homme and Andreas Neumann, traces this union – from the initial songwriting sessions and recording process to the subsequent critically-acclaimed Post Pop Depression tour. Originally released in theaters via More2Screen and Eagle Rock Films in the summer of 2017, American Valhalla goes beyond a behind-the-scenes music documentary. Presented via Neumann’s stunning photography and cinematography, with intimate conversations led by Anthony Bourdain, the film explores themes of taking chances, instincts, and legacy. As Homme stated, “You risk nothing, you gain nothing” – a mantra echoed throughout the film’s 81 minutes. Once inspired by Pop’s revolutionary raw brand of rock to make music of his own, everything comes full circle when Homme is contacted by his idol, out of the blue, to work on some songs. We see them meet, write and record (in total secrecy) at Rancho De La Luna studio in the Mojave Desert with Queens of the Stone Age’s Dean Fertita (guitarist) and Arctic Monkeys’ Matt Helders (drummer). The lens is set on these interactions, as we watch these relationships evolve. Between lyric sheets, letters, journal entries, and riffs, viewers can experience the organic chemistry that blossomed into Post Pop Depression. "As we got to know each other, you blew my mind" Homme tells Pop in the film. "You really came with such an open mind and saying ‘Yeah, I know what I’ve done but I’m here to...look forward."" As they prepared the tour to support the album, Iggy received news of the passing of David Bowie – his longtime friend and confidant. In these moments, Pop contemplates his own impermanence and, at his most vulnerable, pushes harder with carpe diem-resolve to rehearse and add the next great landmark to his legacy. Pop, Homme, Fertita, and Helders, are joined by Troy Van Leeuwen (guitarist – Queens of the Stone Age) and Matt Sweeney (bassist/guitarist) as they hit the road. American Valhalla sets its scope onstage and backstage as they warm up, pump each other up, and deliver explosive sets, leading up to the final show at the Royal Albert Hall in London (captured on Post Pop Depression: Live From The Royal Albert Hall DVD and Blu-ray released via Eagle Rock Entertainment in 2016). MaidaVale Streams Video for "Deadlock"
Phantom Winter Releases New Song "Frostcoven"
Dirge Within Quits YET Again! Toarn Releases Video for "Jonah"
CAPITAL NORTH UNVEIL VIDEO FOR "GLASS HOUSES"
XAEL Unleash New Video for "Last Arbiter"
Divine Realm Release New Song "Hanging Valleys"
HIS DREAM OF LIONS STREAM NEW SINGLE "SWINGIN"
RXPTRS ANNOUNCES DEBUT SINGLE "BOUND"
Between the Planets Gets Signed! High Priests Streams New Song "Control"
Atala Releases Video for "Tabernacle Of"
Dagon Streams New Album "Back to the Sea"
Smooth Sailing Streams New Song "Stevie Ray Oiye"
Susperia Releases Video for "The Lyricist"
Curses Releases New Single "Rest"
Kurgaall Releases Video for "Satanization"
Tragul Announces New Members Joining the Band! DEATH ON FIRE RELEASE VIDEO FOR "REQUIEM"
Piss River Releases Video for "Bad Reputation"
Age Of Rage Streams New Single "The Road"
Louis Brennan Releases New Single "Airport Hotel"
Y.O.U.N.G RELEASES NEW SONG "LAZY"
Reach Releases New Song "You Say"
Coat Check Girl Release New Single "Awake"
NightPulse Releases New Song "The Rush"
Purest Of Pain Releases New Song "Terra Nil"